AMERICAN WONDER AUTO CLOTH – The Ultimate Cloth for your ride! Super absorbent; machine washable; long-lasting. Holds 12 times its weight in water. Lint-free; Scratch free. Super soft and gentle on all surfaces. Love your car! 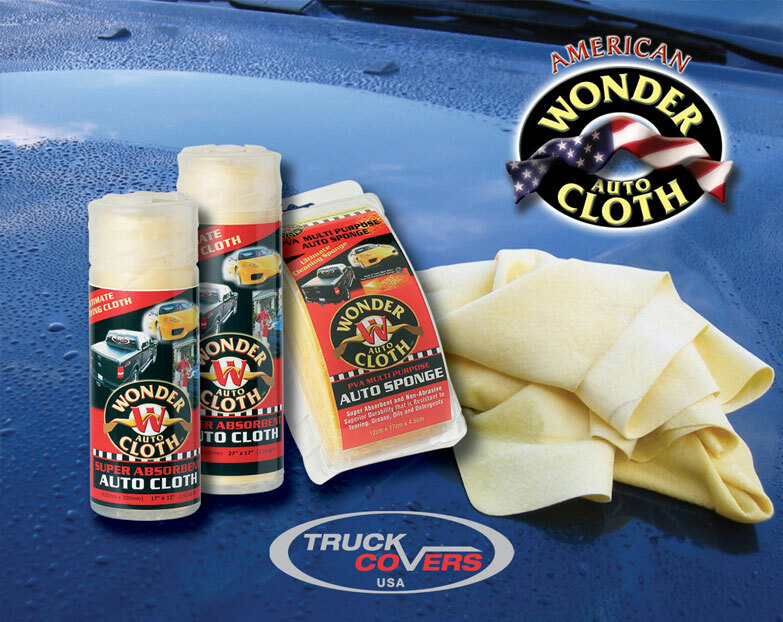 The American Wonder Auto Cloth comes in 2 sizes, large and small. It is the only Auto Cloth you will ever need for your car – inside and out. Wash your car with it – wring it out easily – then dry your car with the same cloth! Dries your car in less than 5 minutes. Removes pet hair, lint, dirt and dust from automotive upholstery and carpets. Ideal for windows. 100% Biodegradable; Resistant to oils, grease and detergents. More durable than any other cleaning or drying cloth or material. Does not tear! It is the first choice of auto-detailing enthusiasts. Comes in its own storage container. THE FINEST CLOTH YOU WILL EVER USE. THROW AWAY THAT CHAMOIS AND MOVE ON TO THE AMERICAN WONDER AUTO CLOTH! Suggested Retail Price for Large is $19.95; Suggested Retail Price for Small is $14.95. Contact Truck Covers USA at 888-808-2872 or visit them on the web at www.truckcoversusa.com to get your American Wonder Auto Cloth today!